"Making your job a lot simpler." "A bit more flexibility can make all the difference." 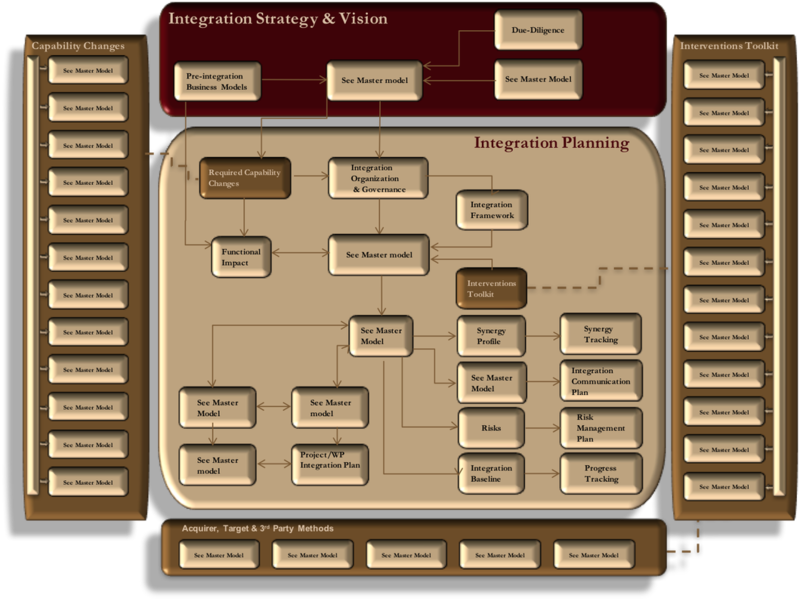 In our experience, we often see acquirers struggling with their integration approach and their ability to manage the associated complexity. They also lack the required competencies and have severely constrained capacity. The outcome is unfortunately too familiar. So what is the seemingly invisible force that steers acquirers into this situation? More often than not, the answer is a cultural one. 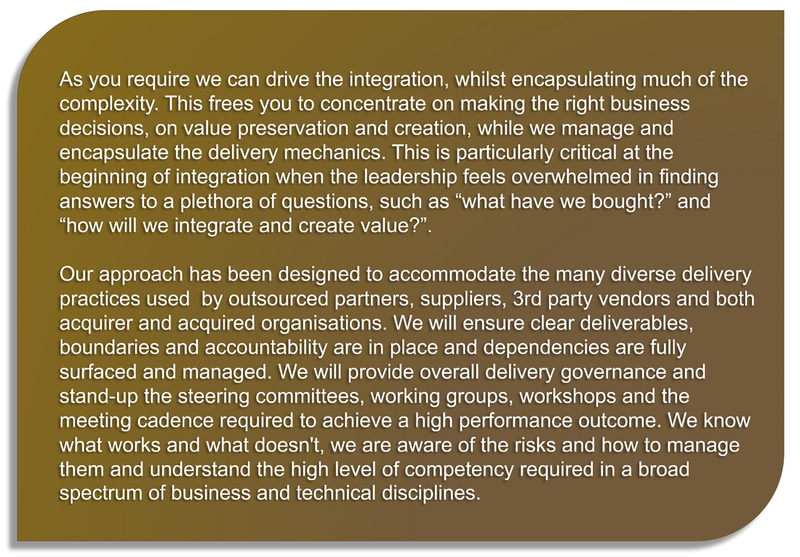 Not the cultural misalignment between the acquirer and acquired organisations. Rather, the ingrained culture of the acquiring organisation, its DNA if you like. Recognise improvement opportunities that have been there all along (i.e., 'unfreezing' opportunities). The ability to adapt and evolve is increasingly critical to corporate performance and maintaining competitive edge. These capabilities apply to both organic and inorganic growth and should already be suitably positioned on the leadership’s radar. ​Fundamentally, self-awareness is the key that unlocks improvement and challenges the influence of corporate DNA. It is the first step on the road to breakthrough performance and the exhilaration that brings. It is part of the reason why we have worked so hard to create the best tools and an holistic approach that is up to the challenge. ​One that can demonstrate whats possible, with relentless drive, creativity, hard work and the pursuit of excellence. 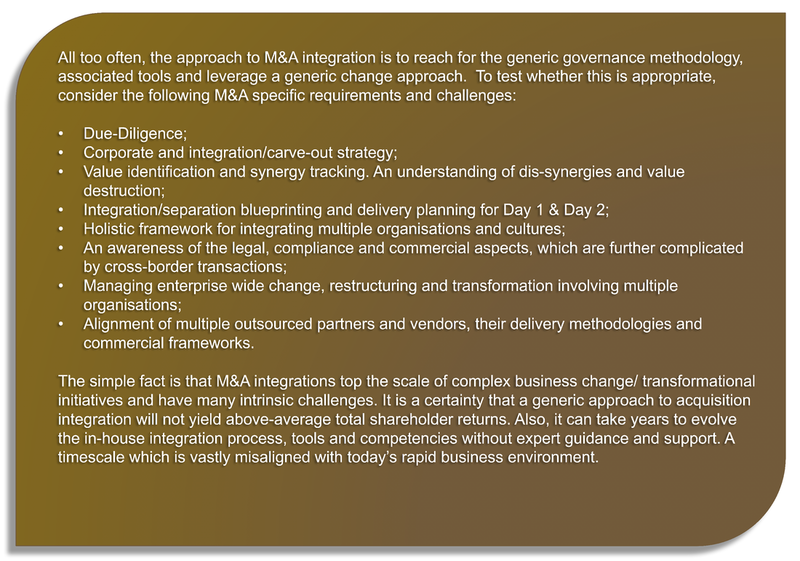 We have learned from experience and working with a wide variety of FTSE 100 and Fortune 500 companies, with vastly different cultures, execution capabilities and maturity, that there's a sliding scale of delivery approaches to M&A integration and separation. 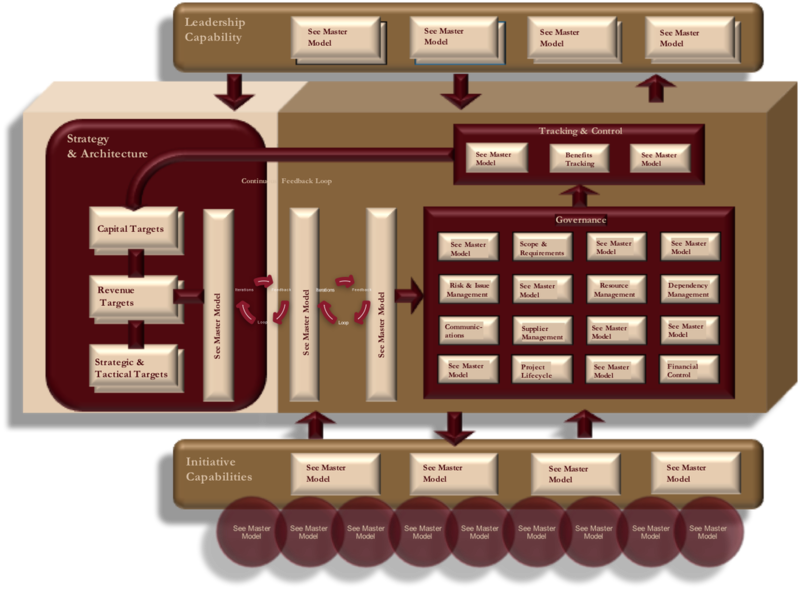 These range from agile to highly disciplined and structured. ​Rarely however, is the black or white space the best approach, but rather a shade of grey somewhere between. Indeed, the optimum approach will also change its shade for different transactions involving the same organisation. Often one of the greatest benefits we initially bring to our clients is helping to remove their polarising lens and opening up their vision to the possibility of breakthrough performance. This provides us with an immense sense of satisfaction.